Effective communication is a life-long learning process. Are you the best you can be? Writing, speaking, negotiating, listening, sales presentations, and the like, are separate skills. How well you combine these can make a big difference in outcome. Give yourself and your team a boost with the personal attention we provide. New hires to C-level. Group or private. Speaking, presentations, workshops, and coaching available. "Janet, everybody loved your talk; it was thought provoking and you gave good techniques for increasing our 'Yeses' and our income! Many women came up and gave me very positive feedback. (They) were engaged from start to finish–I never saw so much note-taking going on. It’s my pleasure to recommend you to other businesses or networking groups, and in fact, I just referred your talk to another organization. It’s rare to say that someone has material so well-suited to a variety of purposes, but yours really hits the mark. On a personal note, I’m using your book as an instruction manual to help a 13-year-old boy learn empowerment techniques; it’s a skill set we need, whether age 13 or 103 years old." You aren't born knowing how to achieve your goals. A caring professional can give you a nudge in the right direction to help you find your path and stay on it. Coaching provides direction, boosts confidence, and demands accountability. Selecting the right coach is a personal decision, similar to finding the right doctor or counselor. You need a good listener, someone who can understand your past process and move you forward with a co-created plan of action. Your trusted coach may also be a person you can lean on, a mentor that provides guidance, a health professional that helps you get into shape, or a personal cheerleader to spur you on as you challenge yourself through setbacks and celebrates as goals are met. We are happy to consult with you regarding your personal and professional career, life, and health coaching needs. Confidentiality is respected and phone sessions are available. "I had a sudden, one-shot deal to sell myself and my concept to a high-level executive. Before my meeting, I consulted with Janet Williams. She briefed me on the publishing, writing, and media aspects. As we talked about the project, she got a quick take on the real me. Janet prepped me with the right words to say about myself so I would sound natural. She asked the right questions, built my confidence, gave me the info I needed, and had great suggestions. The business meeting was a huge success and we're already in the early stages of the project! Janet was a perfect fit, personable, extremely knowledgeable, and a super coach. I highly recommend her." Rev. Janet F. Williams is an ordained minister with the Universal Life Church. She can help you write your vows or vow renewals. All couples welcome. Non-denominational or written to suit your particular beliefs. Fun, serious, costume, beach, home, whatever and wherever! This is your day. Let Janet help you make the most of it. I LOVE what you wrote for us and am so touched by the time, effort you gave to creating something truly personalized. You really listened to us. It's beautiful!!! . It was so very special, perfect really - and you fit in like family - everyone enjoyed getting to know you. Thanks so much! Tamar and I are so grateful to you for officiating the service. You were awesome! We can't thank you enough for being a part of our special day. Yes, we did get "hitched without a hitch." And thank you again for "hitching" us! You are an awesome officiant and person. You should be proud! Janet F. Williams is a wonderful person, speaker and author. Her message is clear and powerful. She brings a warmth and professionalism to her presentation. If you have ever had trouble with 'Diva' authors and speakers, Janet is not one of those. She was flexible and adaptable. As I listened to her talk, I loved her delivery–conversational and friendly. I was thinking to myself, she doesn’t know who she is talking to and it doesn’t matter because her message of 'you don’t ask, you don’t get' fits everyone. We learned that how you ask is as important as what you ask for. From the beginning of her talk, all the way to her last sentence, everyone paid attention. I could sense a high level of agreement as everyone was nodding their heads with each of her points. We will invite Janet back and I would recommend her to faith-based groups, non-profits and businesses. It was a joy to have her and we look forward to her return." 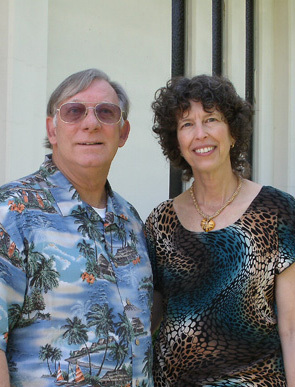 "Janet gave an engaging talk to my chapter of the Lion’s Club, North Park Lions. Her topic, “The Seven Motivators for Effective Communication” was perfect for our group. We asked her to tailor her speech toward our membership drive efforts and she came through beautifully." 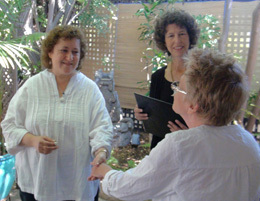 Personalized vows and rings are exchanged as part of this intimate wedding ceremony. From left: Tamar Berg, Rev. Janet F. Williams and Rhonda Shapiro.